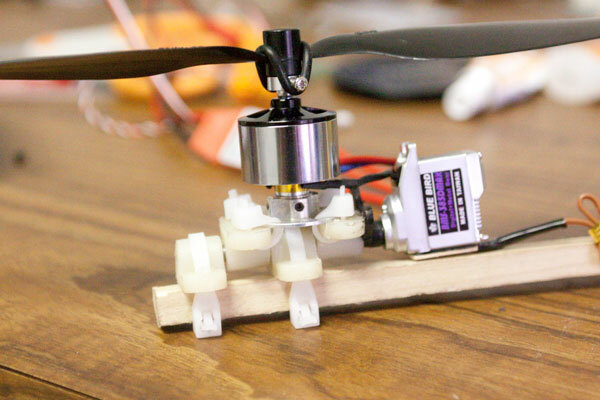 do you have to use a digital servo for the yaw? of can you get away with analog? and whats a got size for it?? Cool build! It looks like the arms are a bit flexible, should they be like that? I also am starting a RCexplorer tricopter. I am going to use his 2.5 build using the coffin body cut out. And i wanted some input. What do you guys think about using the HK carbon fiber board (http://www.hobbyking.com/hobbyking/store/uh_viewItem.asp?idproduct=9781)? I know the risks about cutting carbon at home. I am just trying to order almost evertying from HK just to make my life a little more easy, plus you really can't beat there prices. i used carbon fiber from HK for my tri and it seems to work fine(note i have not got it flying yet) it was easy to cut. and what are the "risks" you talk about? I used GFC (as David did), but CFG will work as well. Could you give us a feedback if the 1mm is OK (stiffness). Has anybody experimented with building the new yaw assembly? I mounted the servo on a piece of servo tape (as well as a plywood "shim" to get them lined up well enough)..
Hey looks good, I'm going to attempt that on my next build, I too am worried about the zip ties, But I put some CA glue on the "buckle" to prevent it from vibrating loose. Bc a zip tie vibrated loose on me one of my motors where I had it zip tied on, luckily I was only a few feet above the ground so no real damage. But I always add a little CA now. if you want to make it removable where your not cutting away alot you can also drop a small dab of hot glue when you zip it down and that helps to make the zipties stiff and stay in place. did it on mine and actually working on rcexplorer's v2.5 of the tricopter now. will post vids and pics when done. Building my tricopter according to rcexplorer plans. I have a question if anyone can help. In his parts list he uses 1 Turnigy UBEC for making the &#8220;jump starter&#8221; for the gyros. But it is not shown in the wiring diagram. So where does it go? It depends on how you want to build up your Tricopter. If you are going to use a HK KK Board V1 or V2 or any other KK Board you don´t need a UBEC. However, if you want to use 4 seperate gyros you need a UBEC because the ESC won´t start otherwise. I suggest you go with the KK Boards because they are getting more and more popular and make this thing much easier to set up then with 4 seperate gyros. I am new at this and not sure about the KK board because of "flashing". No clue on how to do that so I am a bit "nervous" about that. Received my FS TH9X radio a week ago and blew the receiver. (hooked up rx battery backwards) Now I just received replacements (ordered 2 more) now trying to figure out binding then figure out setting up tx. So much to learn and trying to prevent information overload. It will give you a full instruction of how to change firmware to a tricopter etc. I am a noob in pc & programming, but it worked very well for me. Can't go wrong with FR-4 laminate http://en.wikipedia.org/wiki/FR-4. I've used 1,5 mm thick sheet of FR-4. It's not as lightweight as carbon fibre laminate, but it's stronger and won't block radio waves.